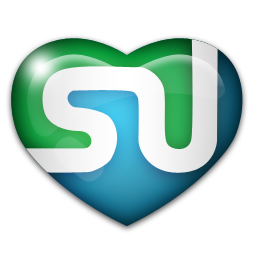 StumbleUpon is a social bookmarking site that is often overlooked when businesses are working to create an online presence. But it can help draw traffic, create more weight for your site and increase your rankings in the search engine pages. Plus, since StumbleUpon is one of the most popular and well used bookmarking sites, it can help your business get found easier from its own search engine rankings. How StumbleUpon works is it allows you to add the URL of your content pages along with a description, category and tags which most closely match the keywords you are using for the particular content piece. Once the URL is in the StumbleUpon system, it will show up to others using the bookmarking service and allow them to also “Stumble” (Share) the URL to their users. It’s all a very simple process. The trick behind building credibility and social proof through StumbleUpon is to add other URLs besides just your own website to your StumbleUpon account. Only add your own sites URLs about 15% of the time. The rest of the time Stumble other URLs that will fit with your business topic and be considered valuable or interesting information for your target market. You can also Stumble other sites you find on StumbleUpon by browsing through categories that best match the topic of your products or services. When you get started, make sure to personalize your StumbleUpon account page with pertinent branding information including your logo. You will have space to tell people about your business and share interests. This page can be helpful in introducing your company to people who are browsing the user community, or want to find out more about who stumbled pages they’ve found valuable. You can then join the communities related to your business and take advantage of the networking opportunities that are available and grow a following, much the same way as any social media site. As with any other social media platform, consistency and engagement are two elements that will create a successful effort in using StumbleUpon for online business building. Having a great profile page, Stumbling relevant websites and engaging with other StumbleUpon users is really all you need to do to make a significant impact. As your rankings grow in Stumbleupon you will notice the increase of website traffic that will come from StumbleUpon users and because of the increased rankings in the top search engines.